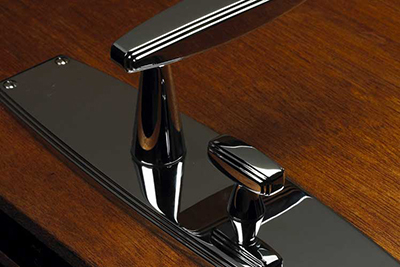 ERIC MORRIS & COMPANY is a manufacturer of fine architectural hardware. We produce the finest quality hardware without compromise. They take pride in providing the best service to our customers every day. Their products are made with extra care and attention to detail in our own factory which has achieved the internationally recognized ISO 9002 certification. Their commitment to quality begins with the selection of raw materials: brass, bronze and stainless steel which meet our strict guidelines for alloy and dimensions. They are further committed to protecting the environment by adhering strictly to environmentally sound practices. They machine to tight tolerances producing repeatable dimensions to assure high quality and compatibility with established standards. At each stage of manufacture, the parts are checked and rechecked to ensure adherence to these standards. Our skilled craftsmen hand finish each piece through many stages of polishing and buffing to achieve a rich high luster that can only be found in brass which is hand rubbed. Each piece is then clear coated with a catalyzed epoxy lacquer to produce a long wearing protective coating, preserving its beauty. A final painstaking inspection assures that only products which meet our stringent standards leave our factory. Similar care and attention is paid to the beautiful packaging which accentuates the fine quality hardware. Visit our Eric Morris Architectural Hardware Sitemap by clicking here!